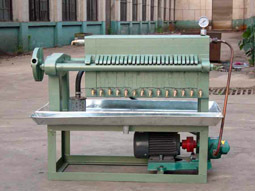 Model 6LB-350, 6LB-250 oil filter press which are mainly used for filtering the crude oil pressed out by screw type oil press.Filter press can be matched with oil press Model 6YL-68, 80, 95, 100, 120,130,160 for combined operation, and they own matched electric motor. The serial oil filter presses of frame typed oil filtering machine are ideal equipments for edible oil plant and individual oil processing house. Crude (freshly extracted) oil contains moisture, and fiber, resins, colors etc. from the plant material, which make it darker and more opaque. These materials are removed by clarification – either by letting the oil stands undisturbed for a few days and then separating the upper layer, or by using an oil filter press. The oil is filtered through a cloth and heated briefly to 100°C to boil off any remaining traces of moisture. This is usually sufficient to meet the quality needs of customers and give a shelf life of several months when correctly packaged. However, the oil requires additional refining stages of de-gumming, neutralising and de-colouring to have a similar quality to commercially refined oils, and these stages are difficult to complete at a small scale. Our oil filter press is characterized by convinient operation, stable technical effect, high capacity and low impurity. Welcome to contact us in the follong form to get further info about our oil filter press, we are always at your service!